Lambert Cottage01263 715779work01603 870304fax Self-cateringSit out on the south facing front lawn and enjoy the peace and harmony with a latte on a warm summers day in this cosy one bed cottage in Snettisham. For wildlife enthusiasts why not visit the local RSPB Bird Reserve or take a trip to the close by popular Victorian seaside town of Hunstanton. Discover the rolling sand dunes of Old Hunstanton watch the waves roll in and the pretty kites surfing in the distance. Lambert cottage is a fantastic bolt hole for two and an ideal base to explore the wonderful Norfolk coastline. *Good Housekeeping Deposit: Please note that a refundable deposit of £150 is required for this property. Sit out on the south facing front lawn and enjoy the peace and harmony with a latte on a warm summers day in this cosy one bed cottage in Snettisham. For wildlife enthusiasts why not visit the local RSPB Bird Reserve or take a trip to the close by popular Victorian seaside town of Hunstanton. Discover the rolling sand dunes of Old Hunstanton watch the waves roll in and the pretty kites surfing in the distance. 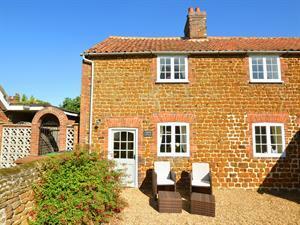 Lambert cottage is a fantastic bolt hole for two and an ideal base to explore the wonderful Norfolk coastline.